Update 2009.03.20: A memorial is planned for April 4. Update 2009.03.14: Finally wrote my memorial post. Update 2009.03.11: The official, authorized, and epic obituary for Bob, written lovingly by his family and friends, was published online today. Please read In Memoriam, Robert Guskind on Gowanus Lounge. It's been all I can do just to keep up with the flood of online remembrances and other reports in response to Bob's death. As of mid-day, there are over 60. Reading everyone's posts brings back my own memories of Bob, which I hope to post over the weekend. Changed the link for the Brooklyn Paper. I just learned, from Windsor Terrace Alliance and Brownstoner, that Robert "Bob" Guskind, founder of Gowanus Lounge, was found dead in his home yesterday, March 4, 2009. He was a colleague, and a friend. I'm stunned, and can't write anything else right now. See Links below for others' coverage of this terrible loss. 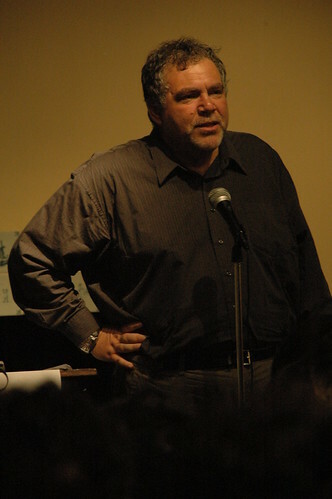 Robert Guskind, speaking at the second Brooklyn Blogfest in May 2007. 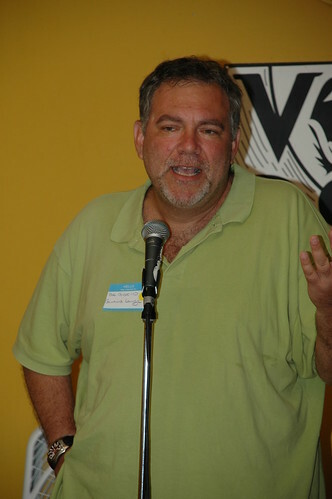 Robert Guskind speaking at the first Brooklyn Blogade, at Vox Pop in Flatbush, in June 2007. One post per site. I've done my best to keep this list up-to-date. If I've overlooked your post, please let me know. Bob and Miss Heather were good friends. I can't believe the cavalier tone of the Brooklyn Paper's obituary. They could have covered the same facts with a good deal less cuteness. It's not an obituary. Stop over-reacting. Anonymous coward: You're right. It's not an obituary. It was an editorial. My mistake on that. "making increasingly erratic Web postings over the past few months"
"The NYPD offered no reports of any suicides near Guskind’s home" has been changed to deaths. "formerly jovial journo" has dropped the "formerly". They made the changes. I wasn't over-reacting. I'm SHOCKED. Really shocked. Bob was, in my opinion, one of the hardest working bloggers I've ever known. He was so friendly and so supportive of bloggers from underblogged parts of Brooklyn. RIP, Bob. Xris, thanks for being vigilant regarding the changes made on the article. I noticed them, but I didn't have my head together enough to document it. The part that annoys me the most (and makes the BP sound like the Post) is the "jovial journo." Ridiculous example of reporting. I was also horrified by the Brooklyn Paper's piece on his death. First they send out an email blast about it, then the disrespectful tone, then the editor snippily sticking up for their story on any blog that dare criticize their coverage. . . I'm disgusted. The Brooklyn Paper also changed a sentence that claimed that Guskind had chosen to pull the Gowanus Lounge site down. Actually, it was just a technical problem. The site may be up in a day or two. Thanks for your work today. Both for your kind words about a great Brooklyn advocate and journalist, and also for calling out yellow journalism for what it is. I've been lucky to work closely with Bob and help him run this website before he passed. I am certainly happy for all of us that the archives are back up! Rest in Peace Bob, bless you for your friendship. I will miss you everyday. I stumbled on this piece on Huffington Post this morning and wound up spending an hour or so meandering around this fine fellows life. What a tribute to blogs that this man is permanently affixed to the heart of his matter. I spent about six weeks in Brooklyn back in the 60's, 8 th avenue & Flatbush, with a school teacher I had met in San Francisco circa Summer Of Love, she took me home and I was made welcome in the neighborhood. I didn't last long but that wasn't Brooklyns fault. Rest in Peace Robert.